Beth Somerset has been writing since 2005 and is also a collegiate running coach. A Health Fitness Specialist, Somerset writes for LIVESTRONG and has also written for the "Journal of Physical Education, Recreation, and Dance," and "Seasons of the Farmington Valley." She holds a Bachelor of Arts in public health (Wellesley College) and a Master of Science in exercise and sport studies (Smith College). Whether it’s bad weather, availability of daylight in winter months, or convenience factors that stand in the way of outdoor triathlon training, it is possible to do high quality training indoors. Using a stationary bike, for example, can be a very effective way to train for the cycling segment of the race. Like using a treadmill to prepare for the run segment, countless workouts for the stationary bike can help prepare you for your next triathlon. Using a stationary bike indoors to train for a triathlon has several benefits, but paramount among these is convenience. Inside, you don't have to deal with traffic on the road or bad weather. You’re more in control of your workout: you decide the intensity, the time of day you ride and the exact duration of the session. Four types of stationary bikes are available: upright, recumbent, group cycle and a road bike mounted on a stationary trainer. Body position on an upright stationary bike is comparable to that for an outdoor bicycle. A recumbent bike allows you to sit lower and lean on a backrest with your feet pedaling out in front of you. Recumbent bikes are the least similar to a real bicycle and thus not a good option for stationary bike triathlon training. A group cycle is very similar in ride feel to a road bike and an excellent indoor training option. A road bike mounted on a stationary trainer is an ideal option, as it's a real bike and you can use it in your own home. Base the duration of your stationary bike workouts on the distance you are training for and your average cycling pace in miles per hour. For example, if you usually average 15 miles per hour on outdoor rides, and the triathlon you’re training for has a cycling segment of 14 miles, you would complete that segment in 56 minutes. Therefore, most of your stationary bike workouts should last at least 56 minutes. Endurance-focused workouts can be longer, however, while speed-focused workouts could be shorter but more intense. Your stationary bike triathlon training should be balanced with run and swim workouts each week not only so that you are well prepared for all three segments of the triathlon, but also so that you avoid overuse injuries commonly associated with excessive cycling. Cyclists often complain of knee problems, neck and lower back pain, Achilles tendonitis and a variety of groin irritations from too much time in the saddle, according to an article published in "American Family Physician" in 2001. Cycling indoors on a stationary bike may require extra motivation since you can’t enjoy the scenery of the outdoors. If you’re training on an upright bike or on a stationary trainer, try listening to music, reading a magazine, or watching TV while cycling. Music can motivate, while magazines and TV can be entertaining. 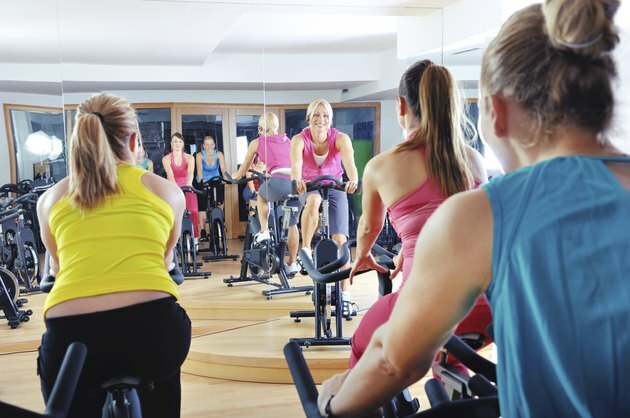 For extra inspiration, try a group cycle class at a gym. These are intense, interval-based group classes led by an instructor and set to energizing music, and they’re sure to challenge you.